Just like its predecessor, Just Cause 3 is going to get a multiplayer mod. One of the best things to happen to Just Cause 2 was the release of a mod that let you play the open-world game with hundreds of your closest friends. The chaos and destruction were widespread. 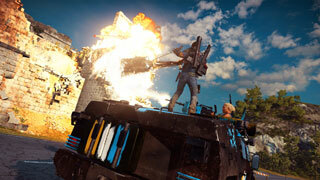 Now its newest sibling, Just Cause 3, is getting a multiplayer mod of its own. The new mod is being created by a team that calls itself nanos. It has developed multiplayer mods for games like Mafia 2 and GTA 4, and was working on an alternative multiplayer mod for GTA 5 before the project was brought to a halt by a cease & desist from Take Two. That shouldn't be an issue for this project, as the mod group's site claims that the project is "officially approved by Avalanche Studios and Square Enix and is currently in development." The team ran into a bit of a hangup in dealing with the Denuvo anti-piracy tech, but they've moved past that now, and a new trailer (seen below) shows off multiple players soaring through the world. The mod still has a ways to go before it is complete, but according to a post made by the mod's community manager, the build is "slowly getting to a really playable state, as we were able to play for about an hour without a single crash or timeout." There's no release date set for this mod, but you can bet that the mayhem that ensues once it's live will be worth checking out. Huh. I could swear I already saw a working MP mod for JC3 already on the mod site for it. Maybe the Just Cause devs could have multiplayer standard, instead of being lazy and relying on mods. I keep considering buying a Just Cause game, cause it reminds me of Mercenaries 2...but Mercenaries 2 had co-op by default. Dicking around with friends is fun. Considering the chaos that was the Just Cause 2 Multiplayer Mod I can only imagine just how beautifully fun this would be. They posted a video, but it as they said in the article, it can only last for a certain amount of time. I think the vid was about a group of players driving supercars off cliffs. OT: I am really sad that I have not bought this game yet. I spent so much time with JC2, but I haven't heard much positive things about JC3. One of the bigger disappointments from the hype monster of 2015.